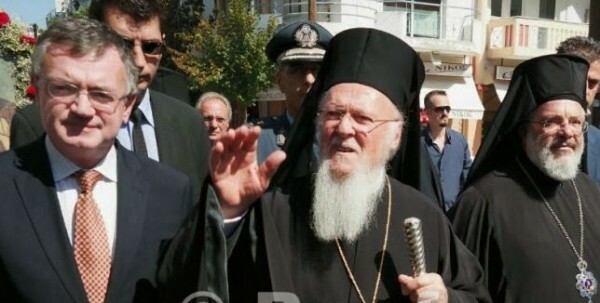 Residents of Orestiada, in Greece’s northern prefecture of Thrace, warmly welcomed Ecumenical Patriarch Bartholomew, who began on a four-day visit to the area on Saturday. Bartholomew was welcomed at the Orestiada Square by Metropolitan Damaskinos of Didymoticho, political, church and armed forces representatives from Orestiada and neighboring Soufli, as well as by cultural organisations, children and people scattering flowers. Deputy Foreign Minister Kyriakos Gerontopoulos represented the government. Also attending were Deputy Education Minister Alexandros Dermetzopoulos, Deputy Interior Minister Giorgos Dolios and MP Marinos Ouzounidis. In his address, the Ecumenical Patriarch referred to Thrace’s rich ecclesiastical history and its strong historical connections with the Ecumenical Patriarchate. He later went to the Greek Orthodox Church of Saints Theodore, where he presided over a celebratory liturgy. Earlier, on his way to Orestiada, the church leader stopped at a border guardhouse, where he blessed the officers and soldiers present. Christians celebrated Easter with church masses in several cities across Turkey on April 20.